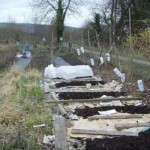 Brassicas, Broad Beans and Even More Mulch! 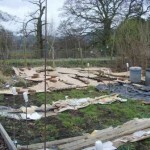 Spent a few hours at the allotment it was rather cold so had tea breaks and lunch in the polytunnel. 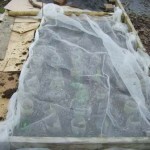 We optimistically planted out brassicas and covered them with enviromesh; and broad beans covered with a fleecy tunnel. We also managed to mulch another area of the ground to suppress the weeds.